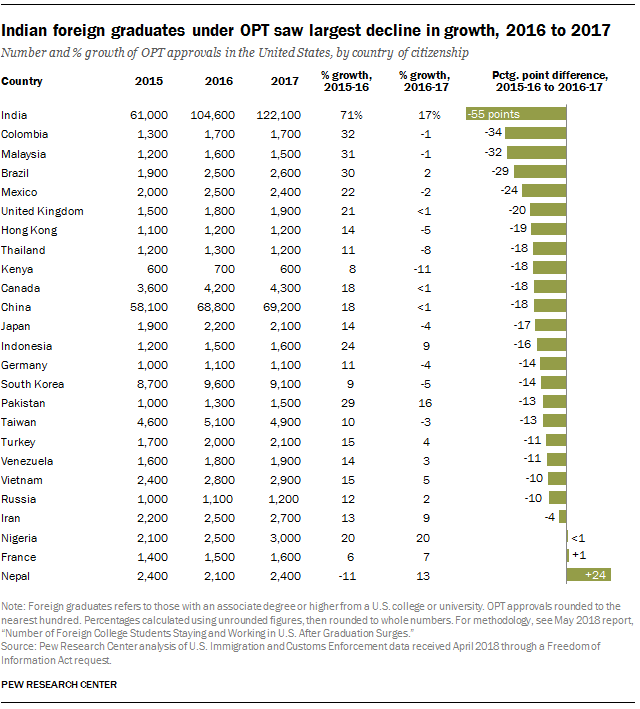 A record number of foreign graduates of U.S. colleges and universities obtained temporary authorization to work in the United States through the Optional Practical Training (OPT) program in 2017, but growth in the once-booming program has slowed dramatically, according to a Pew Research Center analysis of government data. In recent years, the OPT program has surpassed the H-1B visa program as the nation’s largest source of new temporary high-skilled immigrant workers. In 2017, a record 276,500 foreign graduates received work permits under the OPT program, up from 257,100 in 2016, according to data obtained from U.S. Immigration and Customs Enforcement through a public records request. However, growth has slowed considerably: The number of enrollees grew by 8% in 2017, compared with 34% in 2016. That’s the largest decline in the annual growth rate since 2004, the first year for which data on all foreign students are available. The slowed growth also follows a longer period of rapid expansion for the program. From 2014 to 2016, the number of enrollees nearly doubled in size, growing by 93%. Declining growth of the OPT program is due in part to a smaller increase last year in the program’s foreign graduates who majored in science, technology, engineering or mathematics (STEM) fields. In 2017, enrollment of STEM graduates in OPT grew by 13% over the previous year, compared with 48% annual growth in 2016. This slowdown happened despite the maximum length of employment increasing from 12 to 36 months in 2016 for foreign graduates with STEM degrees. (By contrast, an extension for STEM degree holders in 2008 did contribute to a large increase in OPT approvals.) The decline in 2017 also coincided with low unemployment rates for U.S. workers with a bachelor’s degree or higher. The Trump administration has tightened regulations that govern the OPT program. Under U.S. Citizenship and Immigration Services rules posted online in January, foreign graduates working under OPT must now work at the employer’s place of business. (Previously, foreign workers could work at a third-party site, such as at a client’s office.) In addition, the administration has announced plans to roll back the 2016 employment extension for STEM graduates, though this change had not been implemented as of July 2018. OPT enrollment growth slowed substantially in 2017 among foreign students from India and China, the program’s two largest countries of origin. In fact, only France, Nepal and Nigeria saw their annual growth rates increase in 2017 (among nations with 10,000 or more foreign students enrolled in OPT from 2004 to 2017). Growth in the number of foreign graduates under OPT slowed in 2017 across all degree levels, but the trend was most pronounced among master’s degree holders. About 188,600 foreign students held master’s degrees in 2017, a 9% increase over the previous year – far lower than the 45% annual increase seen in 2016. This slowdown follows a period of rapid growth: From 2014 to 2015, the number of foreign students with master’s degrees jumped by 57%, the highest annual increase of any degree level since 2004. Note: The full methodology for this analysis can be found here. Also, see where foreign student graduates worked in the U.S. between 2004 and 2016 in our interactive.